We went to Martinis because we had one of those Living Social coupons and it was about to expire. 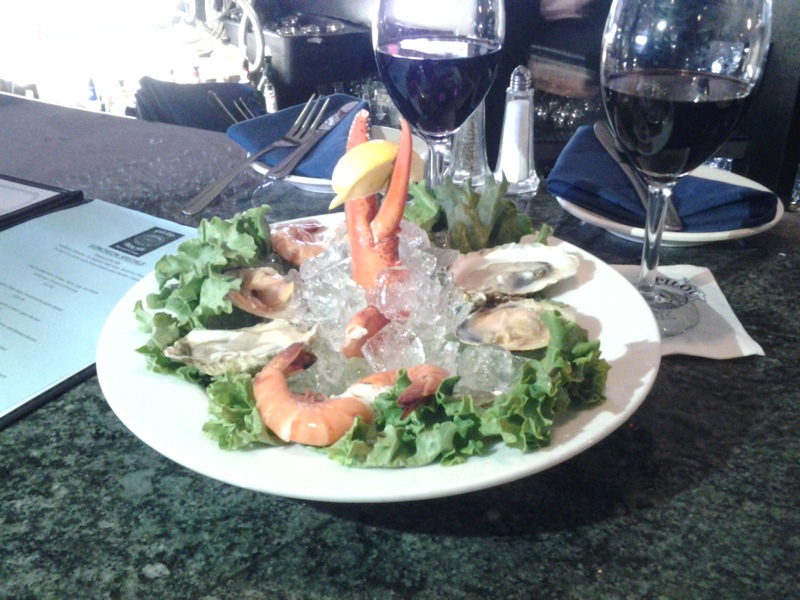 We’d heard that they had pretty good food, and on Tuesday nights, live jazz. But it was really about the $15 coupon value we were soon to lose, so we were delighted when Martinis turned out to be a great dining experience, one chock-full of pleasant surprises. First surprise: the restaurant was packed on a Tuesday night, with all eyes on a stage at the back of the long, narrow space. We were led to a high-top near the windows on Main Streeet by the same Jimmy who’d taken our call earlier and told us the kitchen was serving until 10. A young server, who turned out to be his daughter, Meg, brought us menus, then returned promptly to take our drink order. No waiting here, despite the crowd. We were treated like regulars. Thinking that one should order a martini in an establishment called Martinis, The Big Dog chose a tiramisu concoction ($12) that was very sweet. Surprise Number Two came later, when we learned that the name comes not from the increasingly tarted-up classic beverage, but rather from the name of the restaurant in “It’s A Wonderful Life.” Gina selected a Carnivor cabernet ($8). The menu offers all kinds of interesting items, which can be good and bad. Often, what sounds like a good idea is actually not good at all. We decided to start with something called a Boursin Cheese Artichoke ($10), described as a “long-stemmed artichoke stuffed with house boursin cheese, baked with panko crumbs and aged balsamic drizzle.” It was heavenly. A baby artichoke was sliced in half, piled with a delicious boursin, and made crunchy with a layer of crumbs. Yes, it was a small portion for the price, but if that’s your standard for food, may we suggest the whopper junior with fries? We could see Surprise Number Three shaping up: excellent, creative food in a space entirely dominated by a bar. The Big Dog called for a Sunflower Salad ($8), a fresh little plate of what others might call a Greek salad, whose twist was a sunflower oil vinaigrette and a scattering of sunflower seeds, along with some arugula mixed with the usual Greek components. Gina ordered the roasted Statler chicken breast ($16), a classic preparation accompanied by a tasty sausage stuffing, mashed potatoes, and baby carrots (real youngsters, not those giant carrots pared into pellets on a lathe). It was very good. For that price, one would expect a far more ordinary dish. The Big Dog’s entree was “bistro meatloaf” ($17). It was ground veal wrapped with bacon and topped with a tomato-y sauce and smoked cheddar. It too was served atop mashed potatoes and carrots. Surprise Number Four? Host Jimmy returned a bit later and confided that the very nice jazz music was not your average has-beens, but rather the quartet who ordinarily supports a classic crooner who these days spends his time with a singer named Lady Gaga. Their artistry was an excellent compliment to the outstanding food. We believe downtown Plymouth is one of the coolest places in southeastern Massachusetts, and once again were not disappointed. A Brazilian grill, as a generic term, is a style of restaurant known as a churrascaria. At a churrascaria, there are typically two all-you-can-eat things going on: acres of an outstanding, fresh, inventive salad bar with familiar favorites and some more exotic dishes; and a barbecue where a parade of waitstaff haul huge hunks of meat to your table and slice off pieces to order. Yes, it sounds over the top, but it really isn’t. We went with friends to the Brazilian Grill in Hyannis for lunch recently… and let us tell you about the music first, to set the tone. The charming hostess, who like the rest of the staff seemed to be Brazilian, thought for a few moments about which of the few remaining tables — this at 2 p.m. on a Sunday — would be most comfortable to us, then led us to one directly in front of where a man with a large collection of keyboards and amplifiers was setting up. Gina cringed, anticipating a wall of noise that would ruin our lunch. Instead, the music, by jazz singer Ravi Melo, was perfect. Most of the songs were Brazilian Portuguese standards, with the likes of James Taylor interspersed, at a perfect volume. We ordered a bottle of wine — a Silver Palm cabernet sauvignon for the table at $34 — from a list that includes a lot of Portuguese choices that might have been a better pairing but sadly, we’re just not familiar with them. By the time the wine arrived, we’d already received three or four items from the parade of meats: some succulent hunks of filet mignon wrapped in bacon, moist pork tenderloins, and chicken hearts. There was flank steak stuffed with chunks of cheese, and little medallions of beef topped with mozzarella. And little sausages. And crispy chicken wings. And lamb. And more. The ladies, well beyond protein overload, ventured to the salad bar and found a surfeit of green treats. Start with mixed greens, a fistful of watercress, a premixed Caesar, or Gina’s favorite, delicate Boston lettuce. Add cool roasted carrots, hearts of palm tossed in a creamy dressing, a julienne of radishes, grilled summer squashes, and any vegetable you can imagine pickled. Or soups! Or an array of sushi! 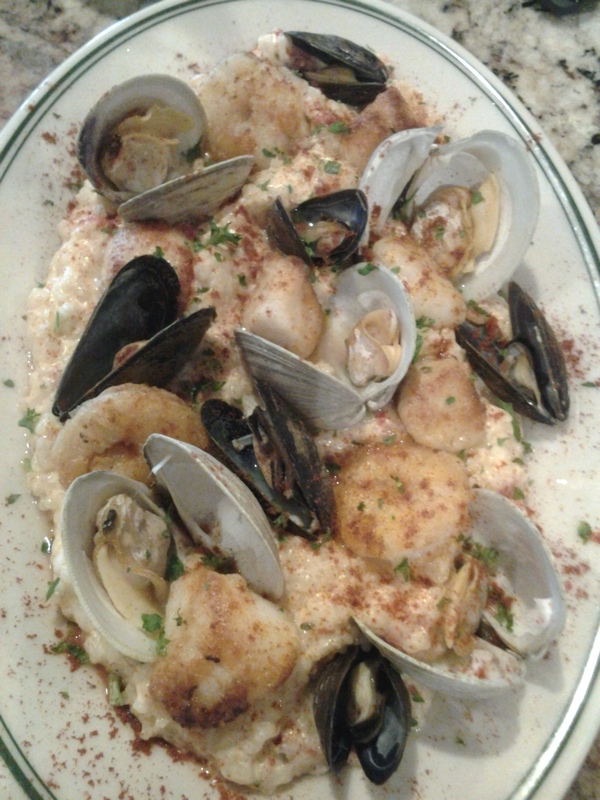 Or hot dishes, with or without seafood! Or even a mounded platter of cracklings. Our orders were classified as the Dinner Rodizio at $32.95 apiece. That’s the deal throughout the weekend, and evenings during the week. The weekday lunch portion, at just $17.95, is available until 4 p.m. There is a soup and salad option, which does not include the more exotic hot buffet options, available weekdays for just $10.95. We witnessed lots of people lining up at the grill with their takeout containers. For just $8.99 a pound, you can fill up a Styrofoam box with your choice of salad items then add your favorite meats. And while takeout may be a good deal, we imagine the price of the box escalates pretty quickly with the juicy meats and saucy salads. You’re really better off hanging out in the lovely restaurant. The cordial waitstaff and the pleasant atmosphere, not to mention the music when available, combine for a special dining experience. In the near future, we’ll find out — and let you know — whether other Brazilian grills spotted in Plymouth and Dartmouth are similar. 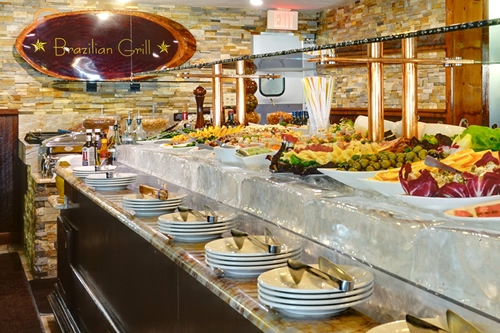 In the meantime, we can assure you that the Brazilian Grill in Hyannis is fun, unusual, and delicious. Brew Fish opened at the site of the former Wave early last summer and we’ve made about a gazillion visits there since, each time fervently hoping that the restaurant would deliver the across-the-board good dining experience we know they can. We were consistently thwarted: delicious food but inattentive service, bad food but we were treated like royalty, sometimes the food and service were both just plain weird. Our recent lunch with our friends Lee and Carl seemed like a perfect time to stop waiting and just do it. Carl is facing the worst kind of health problems. We’ve only known him for a few years and feel cheated that we didn’t have longer together, but we’re sure that even folks who have known him their whole lives feel the same way. We know that he is a musician and a windsurfer and that he worked as a letter carrier in Lakeville, MA, where everyone on his route knows and loves him. 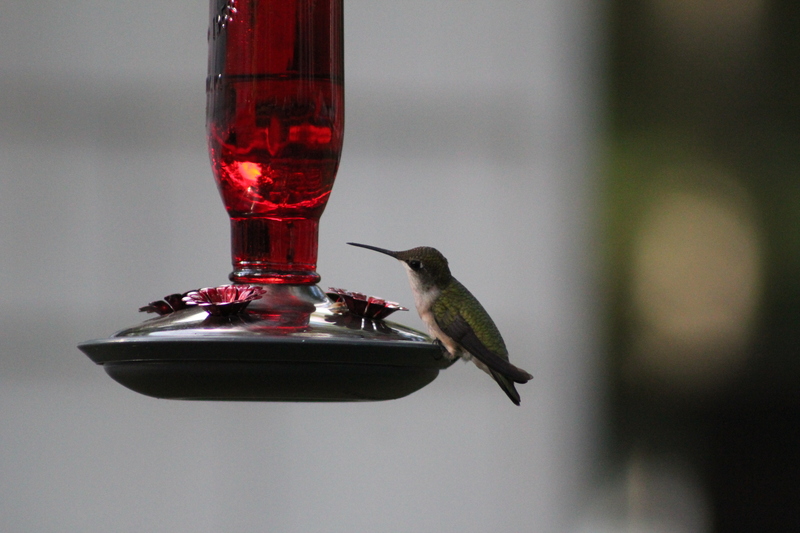 He explained what we were doing wrong with our hummingbird feeder and his fix resulted in a whole flock (see one above) invading our back yard, to our delight. And he’s made us look a little differently at the notion of procrastination. So we were bound and determined to tell about our experience at Brew Fish this time. And that visit was the best we’ve had. Our friends started with cranberry juice, while Gina ordered a Bonterra organic cabernet ($9) and the Big Dog chose a Moby D from nearby Buzzards Bay Brewery ($5). Brew Fish’s emphasis on local beer and wine is a real selling point in our book, and we’ve found that indecision among those seated at the bar is frequently rewarded with a slew of complimentary samples. Also flights are available for trying the ever changing seasonal taps. So now let us tell you about the house soup, because it freaks us out every time we go there, and this time Gina ordered it. It’s a steamy concoction of clams, chourico, potatoes, kale, and vegetables in a creamy broth. Sounds delicious, doesn’t it? It is! Gina ordered a crock ($6) and loved it. But on the menu it’s called “ch’ale” and billed as a combination of chowder and kale soup. Yuck! This poor soup definitely needs an agent. Anyhow, Gina partnered her soup with a side Caesar salad ($5) and was delighted that when she asked server Colleen to hold the parmesan hunks that so frequently mar a perfectly good plate of romaine and delicious dressing, it actually happened. The Big Dog ordered a chicken parmesan sandwich ($12). It was a bit dry (“over cooked”) despite a slather of marinara sauce and melted cheese, but it was also enough for six people. He swapped out the fries for a side salad without any drama. Lee ordered a spinach salad ($11), and got a beautiful blend of fresh baby spinach topped with bacon bits, goat cheese, red onion, and red pepper, drizzled as promised with a raspberry vinaigrette. Carl’s Brew Fish Cheeseburger ($10) was piled high with lettuce, tomato, pickle, and onion, and served with a heap of pale but crispy seasoned fries. The folks who own Brew Fish did an outstanding job of renovating the Wave space. The interior is sleek and urban, and on a previous visit, the bartender showed us how she can control subtle neon backlights behind the rough-hewn bar and around the tray ceiling. During our visit with Lee and Carl we sat in one of the comfortable booths that surround the open dining area. We usually sit at the bar, where the comfy seats are among the restaurant’s great features. The Wave was an interesting place that attracted grizzled locals, sparkly students, and families, and it appears that Brew Fish is pulling the same mixed crowd. We wish the owners well and look forward to the day when we can say with confidence that they have worked out all the kinks. As for Lee and Carl, they’ve also introduced us to a whole brew of cool music over the few years, and we’ve made plans to join them to see a show at the Narrows Center for the Performing Arts in Fall River this weekend. Hooray! Gina and the Big Dog have sniffed out yet another great place to dine in our area. We arrived at 42 Degrees North, on Route 3A in Plymouth, on a warm summer evening to find the snazzy outdoor bar packed with patrons. We spotted a couple of seats but found them marked with cell phones, the new universal symbol for “I’m still here.” So we trudged indoors to the empty bar and nearly empty restaurant, and were glad we did. There, we got the full attention of our affable bartender, Brooke, and learned lots of things. For example, 42 Degrees North is part of a family of restaurants that include two more located further up the South Shore area than we typically venture. They have a fishmonger who delivers a catch of the day and the kitchen is never sure what it’s going to be. They change their menu seasonally, and what we had before us was pretty new. The Big Dog spotted oysters on the menu and Brooke sped off to learn that they were, in fact, the product of our friends at Big Rock Oysters in Harwich. He ordered four ($2.50 apiece) and liked them a lot — they were meaty and characteristically briny, and were served with cocktail sauce and an interesting citrusy mignonette. The wedge salad ($8.95) caught our eye and we split it. A hunk of iceberg came draped with two slabs of bacon in an odd presentation that tasted better than it looked. 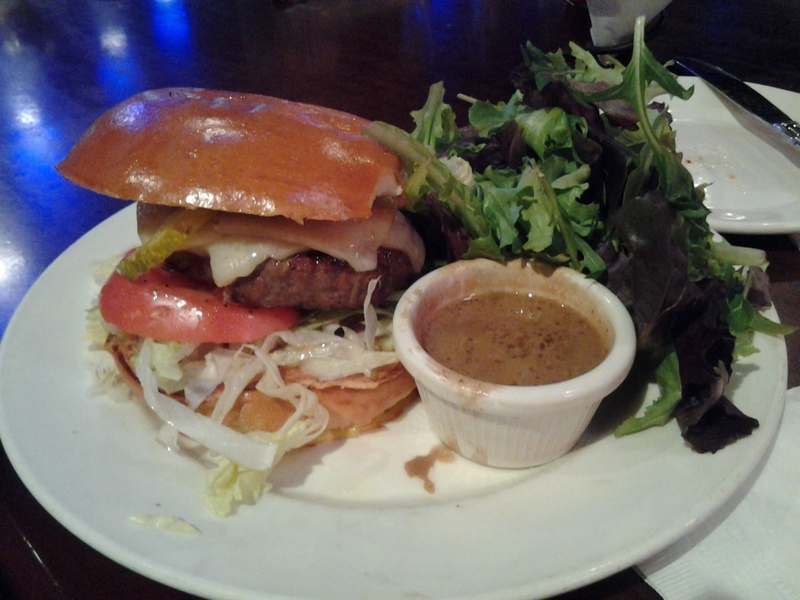 It came with a quartered tomato and more bleu cheese dressing than any two people should ever eat at one sitting. 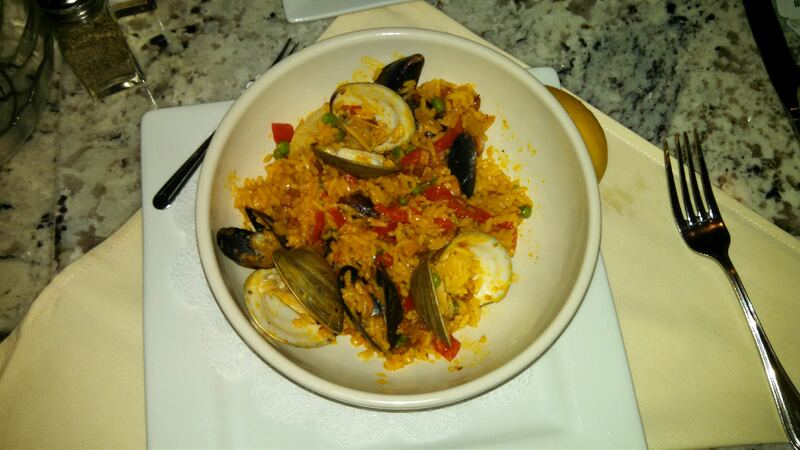 Gina ordered the paella ($21.95), which is an excellent choice for people having trouble making a decision. A big bowl of rice, yellow with saffron and rich with little chunks of tasso ham, was loaded with steamed clams and mussels, just-cooked scallops, peas, peppers, and perfect little shrimp without the annoying tail shells that restaurants so often leave on. It was a hearty and tasty dish. The Big Dog ordered the grilled lamb sirloin (also $21.95, which is about the average for the 18 very diverse entrees). The lamb was cut into pieces and served with a demiglace and a rosemary branch. He ordered it medium well and concluded that medium would have worked for this preparation, but enjoyed it. The lamb was served with a side of quinoa laced with goat cheese that was good enough to try replicating in The Dog House some day. The crunchy little quinoas were bathed in a goat cheese sauce, with some asparagus and portabello mushrooms tucked inside. To our dismay, we found ourselves faced with a very appealing dessert menu and were forced to endure the bread pudding ($6.95). Brooke told us that dollop of ice cream was house-made cinnamon, and that alone would be enough to bring us back to 42 Degrees North. We rarely order dessert (yes, you’ve heard that before) and this enormous, delicious, and creative dish will be difficult to top. No perfunctory BJ’s cheesecake here — the desserts are definitely given plenty of attention in the kitchen. Throughout the evening, Gina sipped a Clayhouse cabernet sauvignon, and the Big Dog chose a Josh cab (each $9 per glass). When there’s a good selection of wines, we typically try each other’s and often make a trade, but not so this time — we each preferred the wine we had ordered. This dinner was more expensive than our norm (about $70 plus wine and tip), and despite the large volume of food we brought home no leftovers. But the high quality food, excellent service, and attractive surroundings made it feel like a great value, and we highly recommend 42 Degrees North. If you find yourself on State Road (Route 3A) in the Manomet section of Plymouth, we recommend making a stop at Aroma Tavern and Grill. The food is good, prices are reasonable, service is friendly, the atmosphere is comfortable, the selection is broad, and the staff accommodated special requests. You can’t ask for much more than that from a pub nestled into a suburban strip mall. Yes, you can ask for a slightly less kitchy decor. 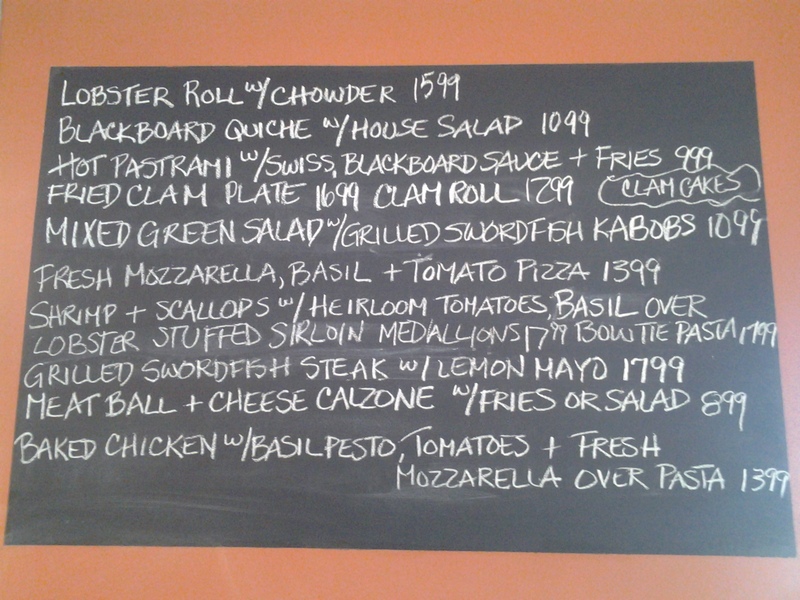 You can ask for sea scallops on your scallop roll, instead of bay scallops. You can ask for the restaurant to reduce the number of special menus — we had four menus apiece, and that was silly. That’s really the best we can do for criticism. In fact, we liked the place so much that after a recent lunch in the dining room with friends, we went back inside to check out the bar, which is where we would normally dine. 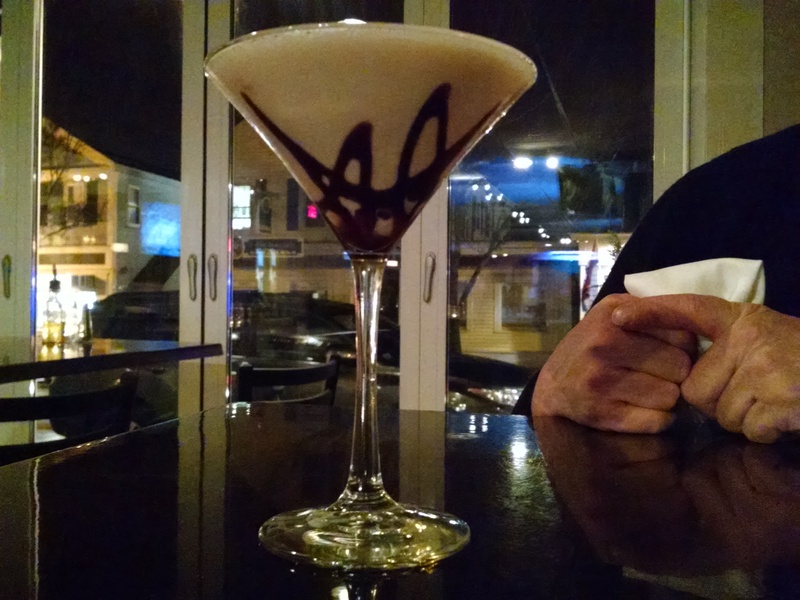 Inspired by N., who was enjoying a Cranberry Flower Martini ($8.50) when we arrived, the Big Dog ordered a Raspberry Truffle Martini ($10). Good enough to order two, but not necessarily a good lunch accompaniment. Spotting an Argento Malbec ($7), Gina didn’t have to think twice. T. had a Blue Moon beer ($4.50 for a 16-ounce draft). Feeling assaulted by all those menus, we decided to start with a couple of intriguing-sounding appetizers from among the regular lunch selections. Potato-crusted calamari ($9), served with orange chipotle mayonnaise, and lobster mac and cheese ($13), served in a little crock, were possibly our best choices of the day. Both were delicious and there was plenty to share. As server Karen promised, the potato flour made the calamari batter airy without a potato-y taste. 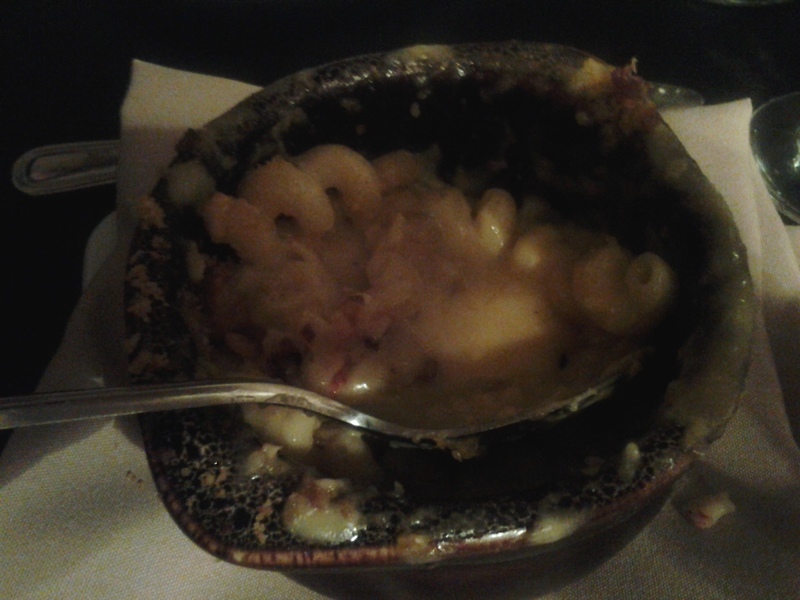 Nearly every bite of the mac and cheese contained a piece of lobster. The Big Dog chose a “Power Lunch” from menu #3, a selection of soup-salad-sandwich arrangements for $10. His choices were the aforementioned scallop roll, which he found disappointing because of the bay scallops, a good little caesar salad, and a very good bowl of chowder. Although the roasted beet and goat cheese salad craze has abated, Gina still orders them whenever she sees them, and this one ($8) was good, with thick slices of beets. She added a lobster roll ($12), which was kind of chewy (but seriously, isn’t lobster always kind of chewy?). The dish ordinarily comes with fries, but Gina requested a substitution and chose a baked potato from among the starches, then disruptively asked for an order of good sauteed vegetables instead, and both the vegetables (mostly cauliflower and zucchini) and the potato arrived, with none of your irritating “upcharges.” Lest you think we’re total pigs, we brought most of the sides home. N and T ordered London broil ($14) and steak tips ($15) and approved of each, saying that they had been cooked properly rare as they requested. Our round booth in the back of the restaurant, opposite a gas fire, was comfortable, but the focus here seems to be on the bright and pleasant bar, where at 3:30 on a Friday afternoon, hightop tables were already filling up with regulars. Our colleague Joan, whose family summers nearby, recommended the place, and we could easily imagine vacationers and beachgoers packing the place on a summer evening. Here in the Dog House we have a policy: If you can’t say anything nice about a restaurant, don’t write a review. Such was the case a few years back when we visited the New World Tavern. We ordered a couple of classic pub dishes — a Middle Eastern sampler and chicken wings — and found them to be so tampered-with as to be unrecognizable, and terrible. We’ve blocked out the details, but it was something like hummus made with butternut squash instead of chick peas, garnished with peppermint sticks. Something like that. But during a recent visit to the Waterfront Grille in New Bedford, Brenna, our enthusiastic bartender, told us a new chef has dramatically improved the food at the New World Tavern. The context was that we should stop by the Pillory Pub at the Plymouth waterfront sometime before it closes for the season on December 1, because she works there nights and it’s a cool spot, then head up the hill to the New World Tavern for dinner. Her perspective was a combination of restaurant insider and Chamber of Commerce pitchperson, and we were sold. So with no other plans for a chilly Saturday evening, we headed over to Plymouth’s waterfront. The Pub is across the street from the state park that houses the famous rock and the Mayflower II, and its expanse of open windows is probably a great vantage point for people-watching on a warm summer evening. Approaching the Pub with November winds whistling across the harbor, we were a little alarmed to see the accordion windows peeled back to expose patrons huddled in blankets. The heat is well managed inside, though, and Brenna served up a Mayflower IPA on tap for the Big Dog and a 14 Hands cabernet for Gina. We walked up North Street to Court Street to find the New World Tavern packed with people, but with minimal effort we slid into a tall cafe table next to six 20-somethings who were out on the town, and listened for a while to Tom Fey singing folksy music and accompanying himself on a guitar. 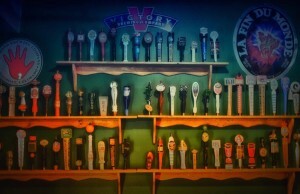 The beer is the star of the show here, and the New World Tavern touts its 32 beers on tap and 120 bottles. The Big Dog chose Mayflower’s seasonal, Thanksgiving Ale, and while Kelly our server clearly thought that was a good choice, the Dog found it surprisingly more like a stout and less hoppy than his usual IPA. Gina ordered serviceable cabernet. The Big Dog ordered a chicken proscuitto sandwich ($12), a salty concoction served on a ciabatta roll, with the slab of proscuitto topped with asiago and a big pile of arrugula. We liked it, and liked the crisp waffle fries that came with it. Gina is on a quest to find the best fish tacos in New England, and wasn’t disappointed here. Nuggets of fried fish were served with a fresh tomato salsa and topped with a tangy buttermilk sauce. For $14 it was a fairly generous portion of three flour tortillas strung together on a skewer. The menu mentions pineapple and salsa verde, both of which, if present at all, were very subtle. The tacos were very good. As we ate, crowds were streaming in to see The Sleepeaters in the back room, an intimate venue with a second bar. Up front, we could hear the band open with the Rolling Stones’ “Dead Flowers,” but the volume didn’t preclude normal conversation. Brenna was right about the New World Tavern, and on our way back to the car we stopped in to tell her so. The menu is weighted towards pub specialties that pair well with beer — pizzettas and burgers each have their own section — with some interesting surprises, like braised rabbit, that we’ll have to return and try. But it was also clear that the days of freeform experimentation are gone. The experience was enough to make us rethink our rule, to say: If you can’t say anything nice about a restaurant, give it another try.